Philippine President Rodrigo Duterte has made good on a promise he made in August to steer relations with China toward mutual benefit and bilateral cooperation. During his visit to Beijing on Thursday Duterte said that he was still committed to discussing the South China Sea territorial dispute in a bilateral fashion with his Chinese counterparts. 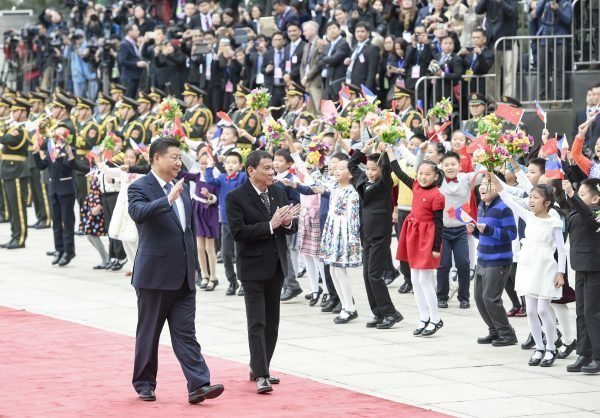 Chinese President Xi Jinping welcomed the Philippine initiative and warmly shook hands with Duterte saying that both countries had emerged from a relationship of “winds and rains”. As the first country to visit outside ASEAN since he took office in June the Philippine president is committed to continuously engaging China in a diplomatic dialogue rather than anger officials there. Relations between the two countries recently took a downturn after the International Court of arbitration in The Hague ruled that China’s historic claims to most of the South China Sea were invalid. China called the ruling a farce and at the time Xi said he would not accept any proposition or action based on the ruling issued unilaterally, and initiated by the former Philippine government. Xi described the new turn in their ties as the springtime of our relationship. In addition to discussing the South China Sea issue the two countries signed 13 agreements and deals worth more than $13 billion. China also pledged financial support for infrastructure projects in the Philippines and said it would lift travel advisories for Chinese tourists visiting the islands. Chinese media hailed the visit as a turning point and a welcome U-turn in the two countries’ ties. Duterte is merely modest example of what the American people (and the rest of the world, for that matter) can look forward to, if Donald Trump is elected. (1)FEAR of reprisal from other Nations destroying America via Nuclear or otherwise. (2)The US Dollar that was Dominating for Decades is NO MORE. The BRICS are Making that difference by collaborating with other nations, with the use of Mutual Respect for country and People. Also Benefiting ALL not just the Selected Few of any Governments. When Filth and Beauty are on The Same Table, they will never, ever, naturally Separate/”Demarcate” other than through “Intervention” – by those who seek to mix Strange Bedfellows via Might-is-Right. For the Unwary of Thought, a Dog has a Super Sense of Smell and yet said Doggie is unable to differentiate Filth from Beauty. Why is that? Because A Dog’s Super Sense of Smell is not for Judgement but merely for Sensing/Informing. Jokers like Uncle Tommee Kobbling Kabalistic Kabinery might imagine that Might-is-Right – but not forever. A Moment will arrive when the difference between Truth and UnTruth is for Judgement and not merely for “sensing”/”intervening”. May Reality arrive before blind acceptance by The Stupid-Dumb that the Relativism between Filth & Beauty are natural Strange Bedfellows.